Considering the vast size and scope of the continent it’s fair to say I listen to, write about, and feature a disproportionate amount of sixties and seventies afro-beat/Soweto/what-have-you on these pages. No apologies, as there have been a formidable amount of incredibly creative and interesting reissues and compilations of late—especially ramping up six or so years ago. 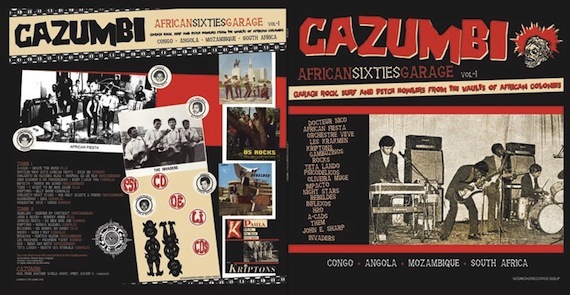 Having said that, here is something from the continent of a different stripe: volume one of the Cazumbi compilation series rounding up 23 tracks of African sixties garage rock. Comprised of 45s originally released in Angola, Congo, Mozambique and South Africa, the collection, released in 2008, serves as a sort of parallel to the original Nuggets set Lenny Kaye unleashed in 1972. Love it! Vocals on “Spell” are right up there with Nina Simone and Fogherty! Great compilation, this is what I’m talking about. I wish I could find a remastered version. I love the energy!Great find.